If the date DOES hold, it's possible that we'll see a twilight phenomenon similar to SpX-15 last June. The Space Test Program-Houston 6 (STP-H6) payload is inside the Space Station Processing Facility high bay at NASA’s Kennedy Space Center in Florida on March 19, 2019. 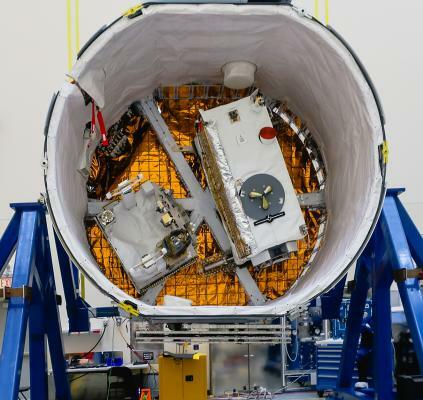 It is being prepared for its move to the SpaceX facility where it will be will be stowed in the trunk of the Dragon spacecraft for delivery to the International Space Station on SpaceX’s 17th Commercial Resupply Services mission (CRS-17) for NASA. 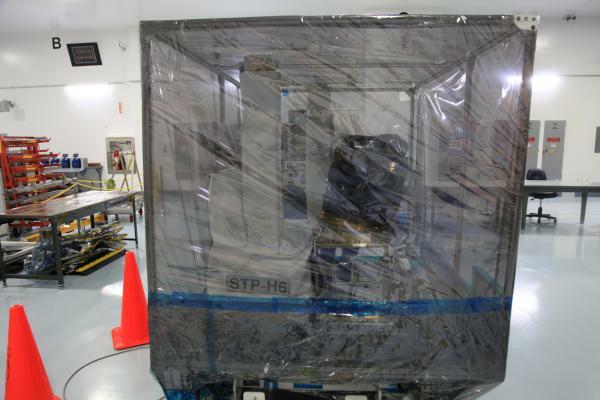 STP-H6 is an x-ray communication investigation that will be used to perform a space-based demonstration of a new technology for generating beams of modulated x-rays. This technology may be useful for providing efficient communication to deep space probes, or communicating with hypersonic vehicles where plasma sheaths prevent traditional radio communications. CRS-17 is scheduled to launch from Space Launch Complex 40 on Cape Canaveral Air Force Station in late April. All infos regarding SpX-17 are removed from the NASA TV schedule. Do we have new information about this launch? NASA sent out media credential approvals for 25 April yesterday. Is NASA really planning on sending Cygnus and Dragon to the ISS just a week apart? I expected NASA to postpone one one of them by a few weeks, but both launch dates seem quite firm. Dragons and Cygnuses have overlapped before. There's no reason they can't launch that close together. Cygnus will get up there and berthed within 2 days of launch, Dragon will follow 5 days later with launch. Dragon will get lion's share of crew time due to time sensitive experiments that need to be performed and then reloaded back on Dragon for the return trip home after a 30-ish day stay. Then the crew will spend the next 2-ish months taking stuff out of Cygnus and then putting stuff back in. Progress is also launching tomorrow. It's a busy resupply month, but there's no reason why they all can't launch and arrive as currently scheduled. Is there any word about whether new EVA suit parts are included in the cargo? CRS-12 was the last use of a new Cargo Dragon. Can anyone fill in the gaps for me for CRS-15 and CRS-17? CRS-15 used Dragon from CRS-9. Got it, thank you. Also fixed CRS-11, that was the first Dragon reuse so I got that crossed up from my notes lol. SpaceX is targeting 5:55 a.m. Friday,April 26, for the launch of its Dragon spacecraft on a Falcon 9 rocket from Space Launch Complex 40 at Cape Canaveral Air Force Station in Florida. Annmarie Eldering, project scientist at NASA’s Jet Propulsion Laboratory, who will discusshow the Orbiting Carbon Observatory-3 (OCO-3), to be installed on the Japanese Experiment Module-Exposed Facility of the orbiting laboratory, observes the complex dynamics of the Earth’s atmospheric carbon cycle. Gisela Detrell, head of the Life Support System research group at the Institute of Space Systems - University of Stuttgart, Germany, who will talk about Photobioreactor, an investigation aimed at demonstrating the use of biological processes to create a hybrid life support system. On future long-duration missions, this approach could reduce the amount of food, water, and other essentials that crews have to bring from Earth. Lucie Low of the National Center for Advancing Translational Sciences at the National Institutes of Health, who will discuss tissue chips, or organs-on-chips. Tissue chips model the detailed physical structure of human tissue using cells grown on an artificial scaffold, enabling higher-accuracy disease modeling and drug testing. Alan Grodzinsky of the Massachusetts Institute of Technology, who will discuss his team’s tissue chip investigation that will study the effects of spaceflight on musculoskeletal disease biology.The goal of this research is to treat the root cause of post-traumatic osteoarthritis disease and prevent permanent joint damage, rather than mask the symptoms with painkillers later in life. To participate in the teleconference, media must contact Joshua Finch at 202-358-1100 or [email protected] by 4 p.m. Friday, April 19, for dial-in information. SpaceX’s Dragon spacecraft also will carry crew supplies and hardware to the orbiting laboratory to support the Expedition 59 and 60 crews for the 17th mission under NASA’s Commercial Resupply Services contract. The space station is a convergence of science, technology and human innovation that demonstrates new technologies and enables research not possible on Earth. The orbiting laboratory has been occupied continuously since November 2000. In that time, more than 230 people, and a variety of international and commercial spacecraft, have visited the orbiting laboratory. The space station remains the springboard to NASA's next great leap in exploration, including future missions to the Moon and eventually to Mars. How is "NET April 26" to "April 26 at the very earliest" a change?